This weeks post is going to focus on another goal that I set for myself this year – taking better control of my finances. The first thing I should mention is that I have always established a budget and for the most part I follow it. Scratch that, I have always kept track of what I needed to spend money on and how much money I have to spend. I usually sit down to do that every week on payday. I have written out a budget, but I don’t usually keep to it strictly. 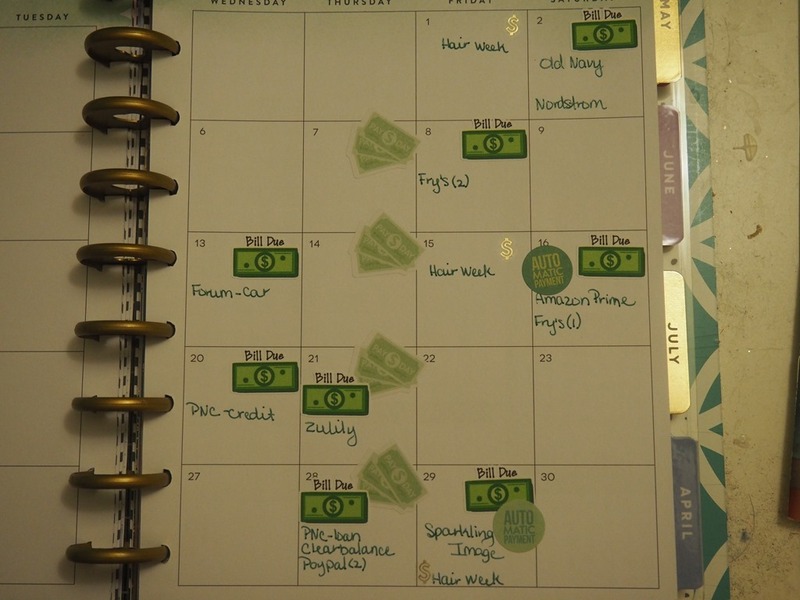 I tend to pay very close attention to what I spend weekly, but never look at the month and how I did as a whole. Does that make any sense? 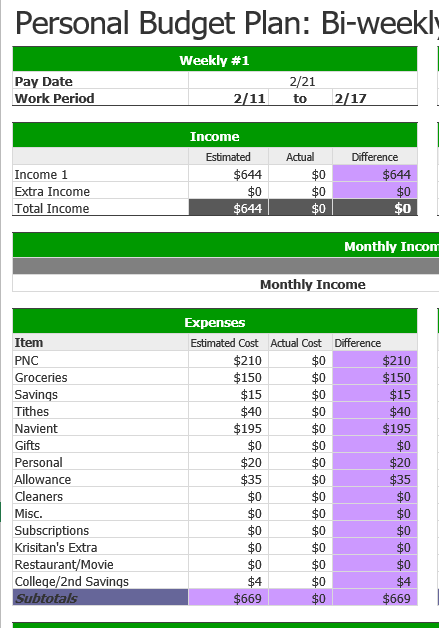 Ok, this is what one of the sheets that I create every week on payday looks like. Part of my goal is to go from that, to using a monthly budget sheet, checking in weekly to see how I’m doing, and at the end of the month do a review and see where I’ve succeeded, where I’ve failed and how I can improve. Additionally, I want to save more – save for my Babydoll’s education (I have a 529 Savings plan, but I need to add more to it), save for things I want to do in the future, save to have a nice emergency fund (a real one – the one they say you should have but most people don’t). Finally, I would like to get my credit card and medical bill debt to be gone. I just feel like a lot of my income goes to those two areas and it hinders me from saving and spending my money the way I want to. 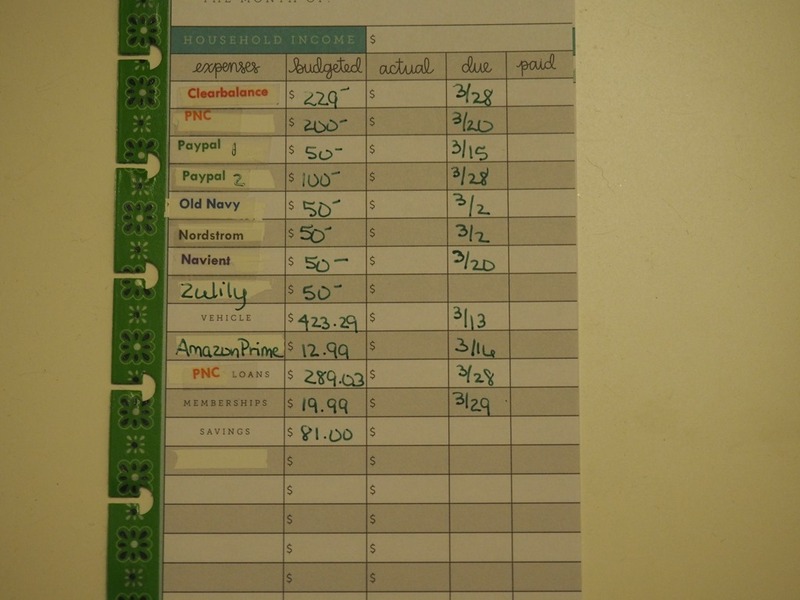 This is the year that I have set the goal to establish a habit of budgeting effective and efficiently. I’ve been looking online, watching YouTube videos, looking at books all in a attempt on what could possibly work for me. Something that I can do and stick to. I need to also have a way to be made accountable. I read that it is a good idea to have a financial buddy. Someone that you sit down with every few months to go over what you have been doing, are you sticking to your budget, where you stand with your goal, etc. The thing is, I don’t have anyone to do those things with. I have friends that are either keeping track with their husbands, or they’re not keeping track. You’re probably wondering why I don’t do it with my husband? 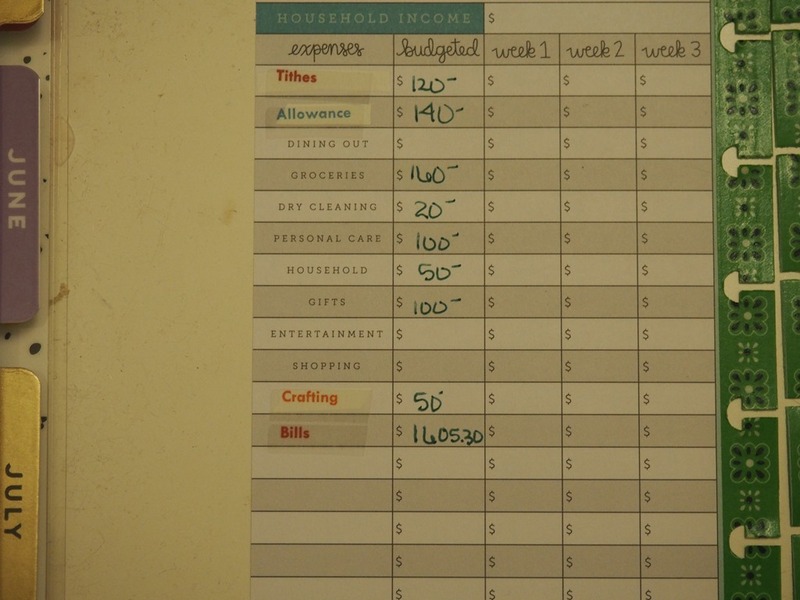 We discuss our household budget, this is my personal budget and financial goals. I guess, I’ll use this blog to be my financial buddy. You guys can keep me honest and accountable. I’ll check in every few months and let you know what I’ve been up to, how I’m doing with my financial targets, where I’m succeeding and failing. 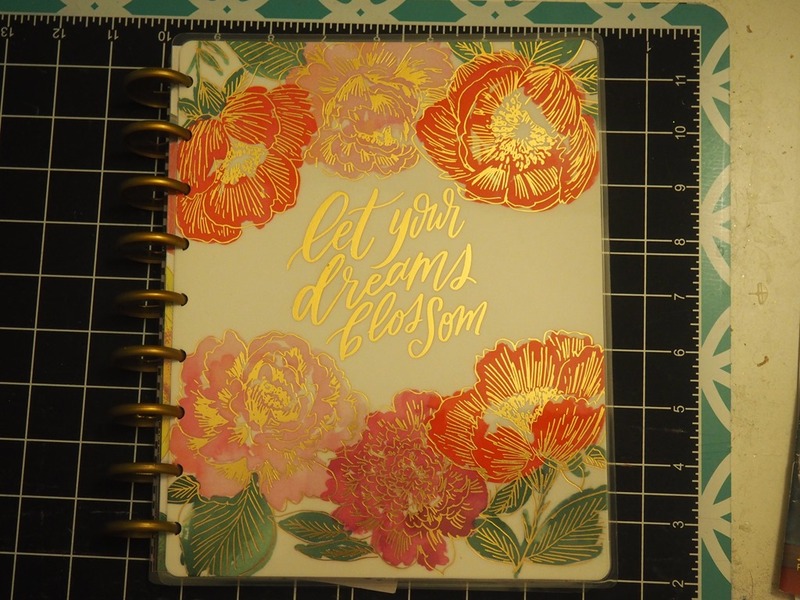 I had started the new year (and the ending of last year) with a mini Happy Planner trying to establish it as my budget planner. I couldn’t find the mini budget extension pack to save my life. So I went about trying to find another way to establish my monthly budget. I used an Excel spreadsheet that I had used previously, but found I wasn’t recording my transactions until the next week that I needed to set the budget. 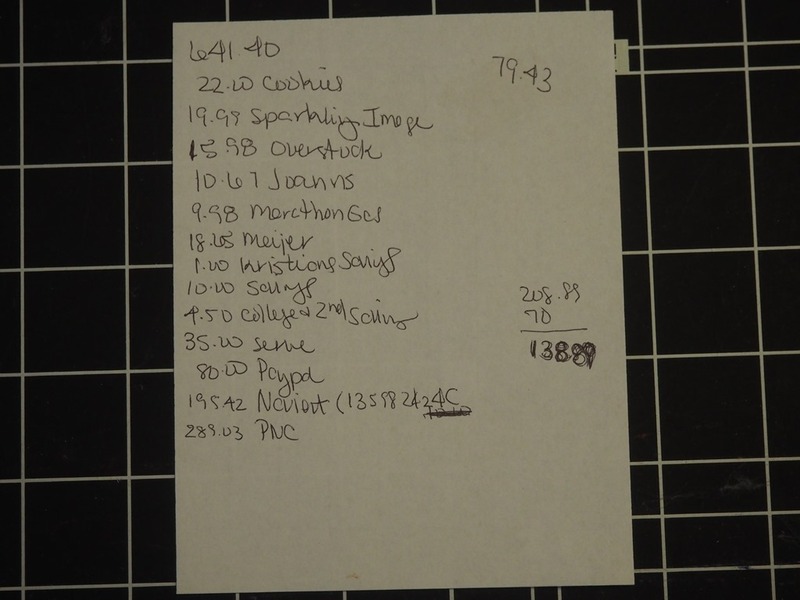 I had the large budget extension pack pages, and used that to keep a record of my daily transactions. I got lazy and stopped writing down the transactions around the end of January. I needed to do better. One day while at Hobby Lobby, I found these small budget sheets. 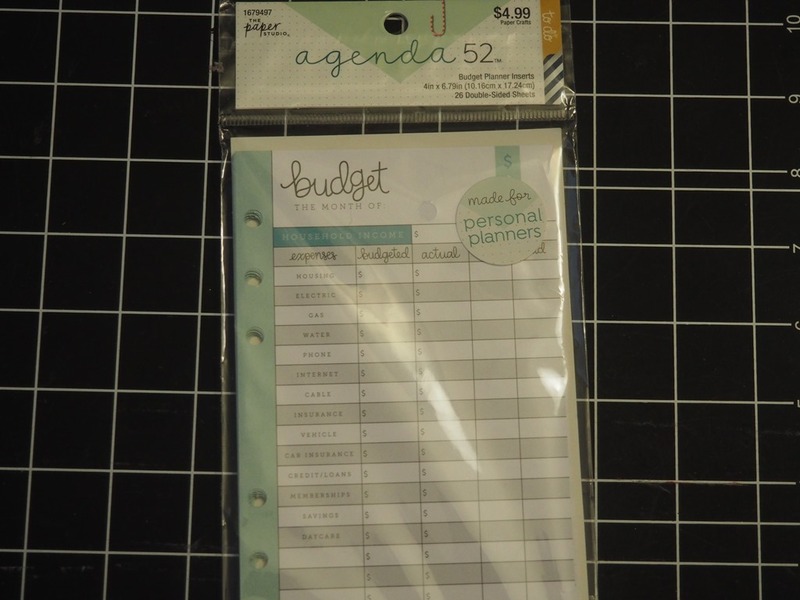 I liked the way they looked and decided to use them in my mini “budget planner”. 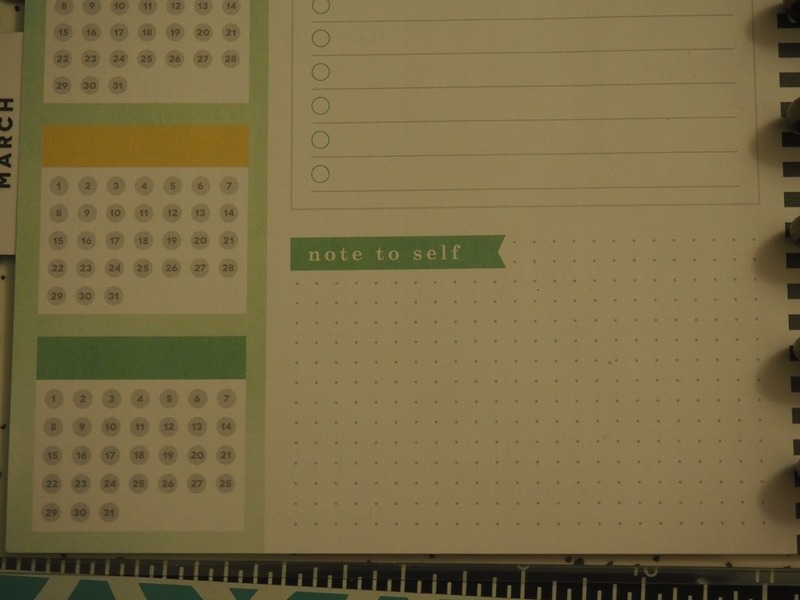 Of course I couldn’t figure out how to insert it in to an established planner layout. I needed something different. 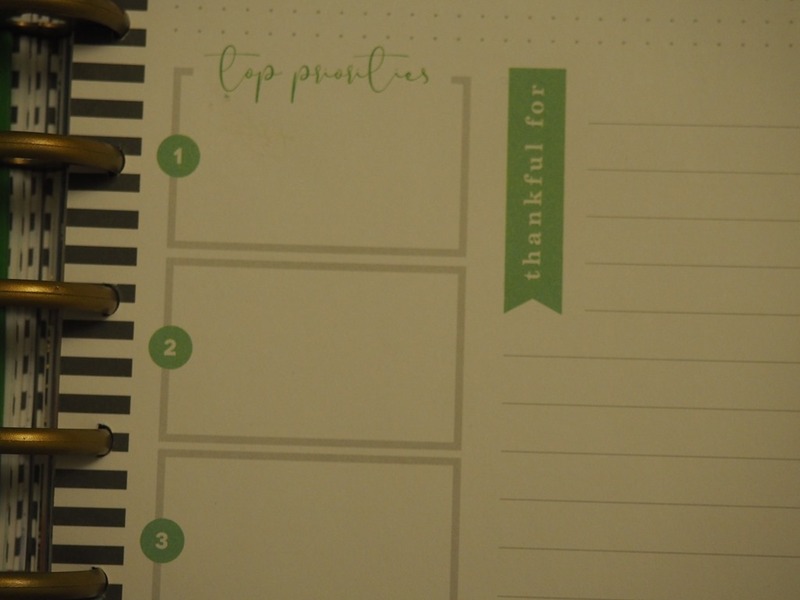 During a planner meetup, someone talked about her monthly Happy Planner. 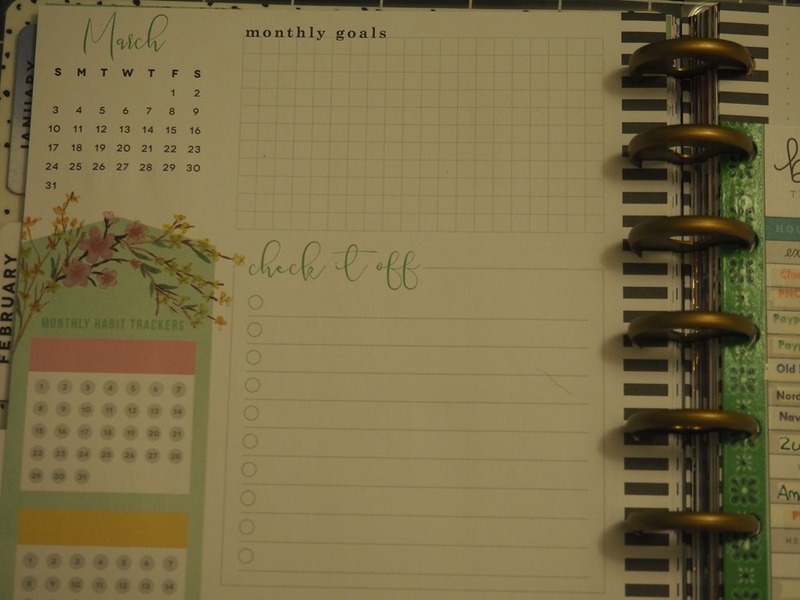 I had been thinking that I wanted a monthly spread and then a place to write out my budget; then a place to review it all. 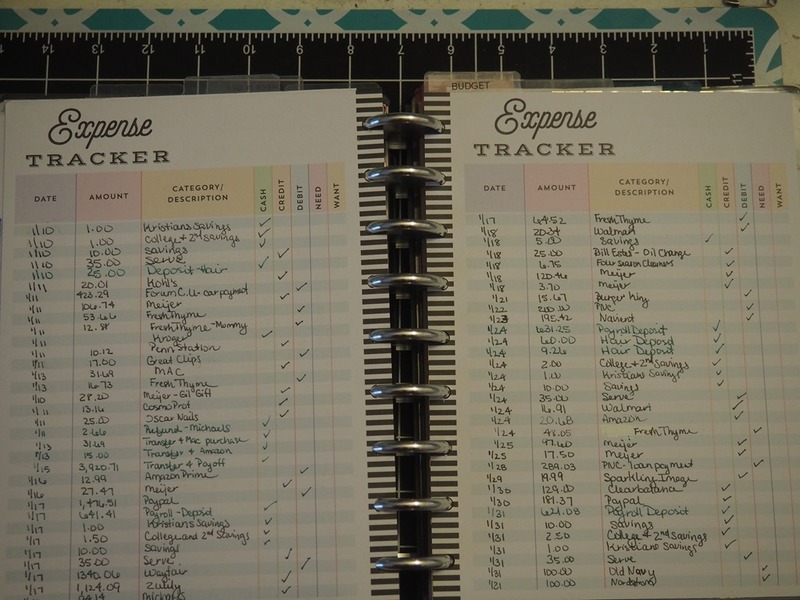 I have begun to watch Shay Budgets on YouTube and her Erin Condren planner that she uses as her budget planner was similar to what I wanted. 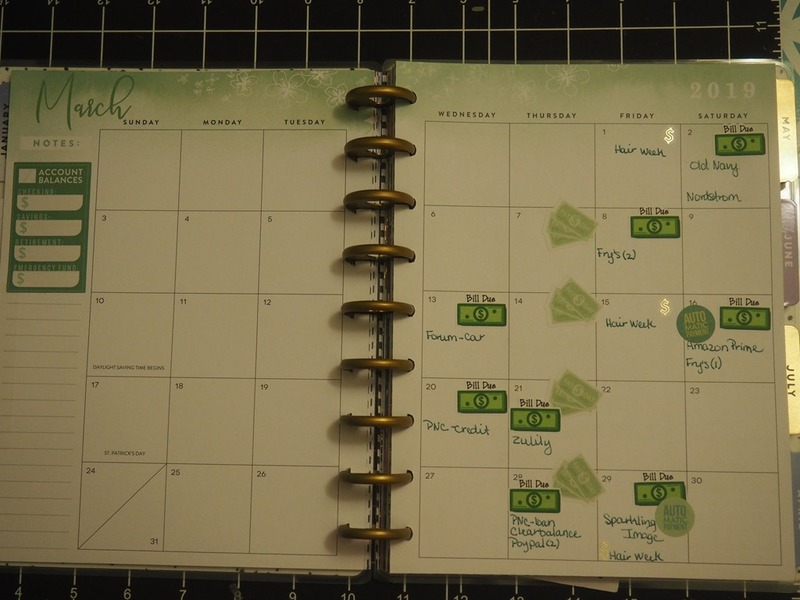 Research revealed that the monthly Happy Planner would work for me. 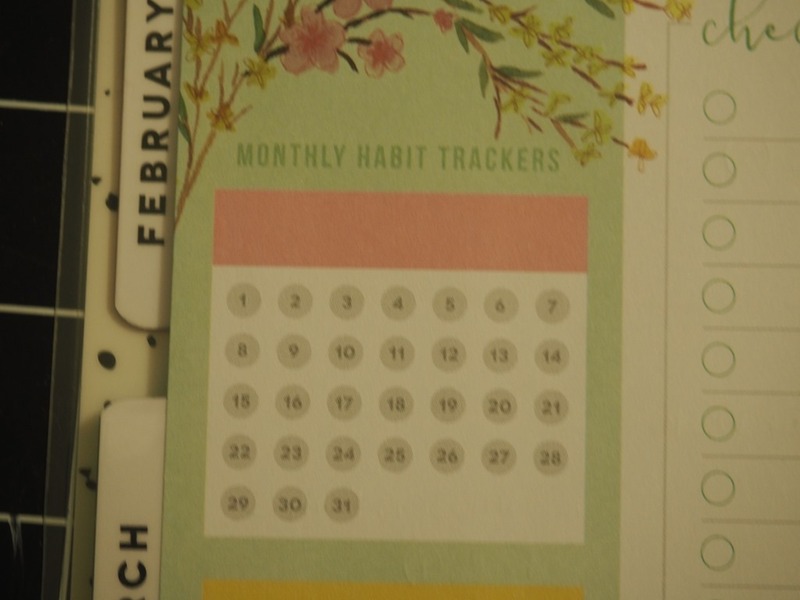 Last week, I went to JoAnn’s to see what if I could find a monthly planner and luck was on my side! I found one and it was clearanced out for ~$8! I set it up like this for the month. I decided to keep the pages that I got from Hobby Lobby because I like the look of them. 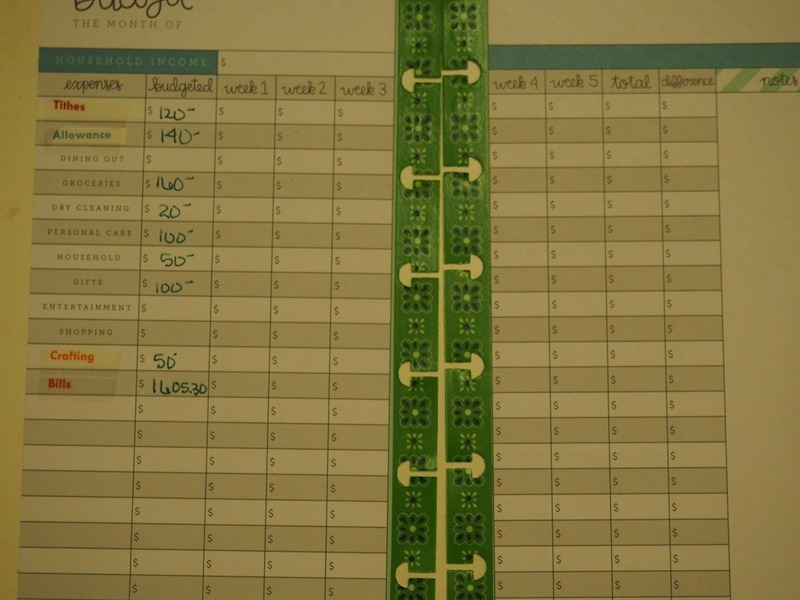 I like that I can keep track of things monthly and weekly. I’ve decided to look for the same pages in a larger version so that it will fit in my new planner. I’m going to figure out how to use the “Daily To Do” and “Notes” pages. I’m going to use the goal page and the progress update page. Ok…this post has gotten long enough and I’m not through with all I’ve done and am going to do in this financial journey. I’m going to continue next week with those things in my next post. As usual, I welcome your comments and suggestions. Until next week. I pray that God has blessed you to begin this new year healthy and happy. How was your New Year’s Day? Did you spend the day recovering from a night of celebrating with friends and family or did you lounge around enjoying the day off? Usually the beginning of the year brings with it the desire to make resolutions that can include getting in better physical condition, eating healthier, giving up a habit, and becoming better organized/removing clutter from their lives. I’ve never been one to make resolutions. I don’t know why, I set goals for myself instead. Would that be considered a resolution? Okay if so, this year I’m going to write it in the blog so that we can see how successful I am at reaching my goals for this year. Let me preface my list by saying that most of my goals are concerning my home. Personally, I’ve been working on them since the summer so it’s more of a continuation than a new goal. Okay…here we go. 1) Get my house painted. Last year when we moved in, I didn’t feel the need to put paint on the walls because I didn’t know what colors I wanted. I felt that I had to live in the house for a while to see what colors the rooms told me they wanted to be. I wanted to see how we lived in the house, how the high traffic areas took their wear & tear, make sure Babydoll didn’t change her mind after 6 months, see what furniture pieces we purchased. What have I learned? My entryway will most likely be grass cloth wallpaper because the pup gets excited when the doorbell goes off and her paws do something terrible to the wall right beside the door. Babydoll did not change her mind about the paint color for her bedroom, but I changed mine THREE times about the color for her bathroom. I want a treatment (I’m envisioning some type of silver glaze) for my one wall in my office. My bedroom is going to be a cool blue/grayish blue. The dining room needs a high chair rail before being painted gray and white (gray bottom, white top – I think it’s called a picture or plate rail). I’ve concluded that my loft/upstairs hallway is still up in the air because I can’t see how to separate the spaces and I we want to change out the furniture up there. So this year to decide was needed. I’m not allowed to paint because my husband is a paint perfectionist, so this is something that I will probably hire out. 2) Get the basement started if not completed. We’ve begun the process getting estimates and ideas from professionals. It’s not a huge area, about 700 sq. ft., but we want it to look nice. We have a very blank canvas – no walls or flooring to work with. We’re not looking for a “theater room”, but another place to hang out and relax. A place where Stan can go to watch his football on the projector screen and use his popcorn machine. We figured we would do it in phases so that we aren’t overwhelmed with construction and cost. Hopefully the phases won’t take too long. 3) Install the water feature in the backyard. A coworker was nice enough to give us a shell to make a pond in our yard. We didn’t get the opportunity to put it in last summer because we spent the beginning of the summer trying to get the fence and patio done. Once that was done we took our family vacation and then Stan was working a lot because we knew he was going to have surgery the beginning of August. It was more important to get as much business work done as possible so that he wouldn’t feel any undue stress during his recovery period. Babydoll asked me yesterday if we were going to actually get the pond in the back yard. I was like “Of course”. There is a home and garden show this weekend that we’ll attend to get some ideas(it’s funny to think about going to that when we have so much snow right now, but we’ve learned that you should make your plans in February and March if you want to get it done by May). 4) Organize my closet. We have a nice sized master bedroom closet. It’s not wide, but it’s long. I knew I wanted to install some type of closet system because the white wire system wasn’t going to work in the long run. We had decided that we didn’t want to clutter up the bedroom with dressers so we wanted to maximize our closet space. Currently we have the three drawer portable storage containers that we keep our underclothes and sleepwear in. I’ll be looking for a system that will allow us to have a couple of drawers, shoe storage, purse storage, tie storage, sweater storage, and then the two levels for pants & shirts. Maybe have a jewelry drawer. Reality my hit me when I actually begin the design process, but I want to utilize ALL of the space. Even the space above the hanging space – maybe I can use that for purse & sweater storage and have a small step stool to access it. I mentioned to Stan about us buying the system and installing it ourselves and he said we can purchase it and have someone install it. Business has been very good for him lately, but it doesn’t leave a lot of extra time for projects. I could try and tackle this project myself, but I’ve heard it can be a dozy. I’m going to do a lot of research; I would like to have it done in a weekend. Is that realistic? 5) Complete the decoration and organization of my office and Babydoll’s room. With my kid becoming a crafting queen, we need shelving to organize all of her crafts. I made the craft table for her and purchased some shelves and other organizational stuff from IKEA, but she’s already gone through the shelves and has stated she needs some more. I’m a big fan of going up when you run out of floor space so I will definitely indulge her on that request. The most important thing is making sure that it looks good. I want her room be something that she can grow into – hence allowing the colors purple, black & white with tons of bling as her color scheme. As for my office, with the exception of paint, a filing cabinet that doesn’t look like a filing cabinet, a stool for my craft table and the reupholstering of my reading chair I’m done. That’s not much huh? I’ll try to keep you guys aware of the projects as they start, during the process, and the completion. So how about you, do you have any resolutions or goals for the new year? Welcome to Red Oven Creations. This blog is about my life - my family, my business, my thoughts my passions (God, cooking and reading). At times it will be crazy, funny, a little serious; but hopefully you will stay around and enjoy my adventure called life.